Everyone always asks about the weather in Asturias, and it’s true that within Spain it seems that it has a bad reputation. However, as a former long term Peak District resident I can absolutely swear that the weather here is pretty good – on average 10 degrees warmer than the UK across the year and with a lot more sun and a lot less rain. However, if I was to say it doesn’t rain that would be a lie, it does, and it can do with a ferocity that will take your breath away. How else would all those trees and plants grow that got it the name the ‘Costa Verde’ or ‘Green Spain’? The difference here is that almost within a day there is dry rock and whatever time of year, if the sun is out it’s warm. If not hot! Summer – Very good. But the summer can be hot, and sometimes very hot. But it’s almost always climbable in the shade and never gets to the southern Spain ‘oh my god I can’t breathe’ levels. even in the worst summers it never rains for too long and is virtually guaranteed to be dry in Leon. Autumn – Fantastic. Almost always dry and although can still be hot it’s less humid and very climbable across all the regions. Visitors have died off and crags will be very empty. Winter – Depends on the year but can be dry or wet into spring and beyond. Leon can be a very good bet in winter with crisp days in the sun perfect for redpointing. Spring – Late spring, and into May is usually very good but March and April are probably the least reliable times. Although I am typing this in March in 25 degree heat that is unseasonably warm. If it’s dry these are great months for redpointing. Over the course of a year, the temperature typically varies from 6°C to 22°C and is rarely below 3°C or above 24°C. 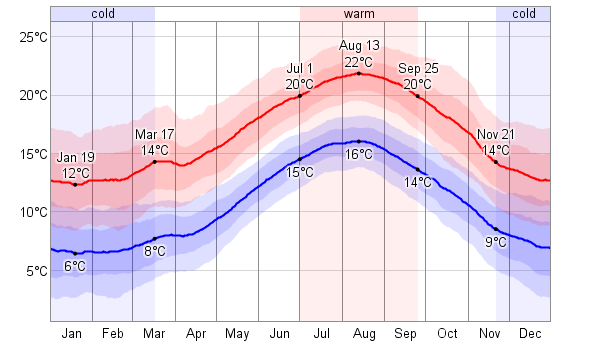 The warm season lasts from July 1 to September 25 with an average daily high temperature above 20°C. The hottest day of the year is August 13, with an average high of 22°C and low of 16°C. The cold season lasts from November 21 to March 17 with an average daily high temperature below 14°C. The coldest day of the year is January 19, with an average low of 6°C and high of 12°C. The average fraction of time spent in various temperature bands: frigid (below -9°C), freezing (-9°C to 0°C), cold (0°C to 10°C), cool (10°C to 18°C), comfortable (18°C to 24°C), warm (24°C to 29°C), hot (29°C to 38°C) and sweltering (above 38°C). The length of the day varies significantly over the course of the year. The shortest day is December 21 with 8:57 hours of daylight; the longest day is June 20 with 15:25 hours of daylight. The number of hours during which the Sun is visible (black line), with various degrees of daylight, twilight, and night, indicated by the color bands. From bottom (most yellow) to top (most gray): full daylight, solar twilight (Sun is visible but less than 6° from the horizon), civil twilight (Sun is not visible but is less than 6° below the horizon), nautical twilight (Sun is between 6° and 12° below the horizon), astronomical twilight (Sun is between 12° and 18° below the horizon), and full night. The earliest sunrise is at 6:42am on June 14 and the latest sunset is at 10:10pm on June 27. The latest sunrise is at 8:58am on January 2 and the earliest sunset is at 5:47pm on December 10. Daylight savings time (DST) is observed in this location during 2012, starting in the spring on March 25 and ending in the fall on October 28. The solar day over the course of the year 2012 . From bottom to top, the black lines are the previous solar midnight, sunrise, solar noon, sunset, and the next solar midnight. The day, twilights (solar, civil, nautical, and astronomical), and night are indicated by the color bands from yellow to gray. The transitions to and from daylight savings time are indicated by the “DST” labels.